At present , i have not set my next goals.I have a few ideas. Taking my time thinking . on my future. I did a 4.8K run this afternoon. Think its important to try to do my daily run. And get in a few Ks until i have decided on what is next. first jog '/ jog in a week. slow . but i am happy i jogged. need to figure out what is next. lots of none fitness stuff to work on. Sunny day and 8C . Everything is closed here. Lots of things on my To Do List. Time for a coffee - think I will head down to Starbucks or ??? And then get on with "list". Monday Morning. seem to be have "temporarily " lost my work ethic. It could be "a change is as good as a rest" . Fifth day of not running or doing anything strenuous. I am doing fair amount of walking. and enjoying a Heineken with my dinner everyday this week. Have not set any new goals for myself. I need to focus on other of areas of my life. Think its time to make some minor changes. The Raptors, are in the playoffs. have never been to a game, but i am interested in how they do hoping to watch the game on TV tonight. And got my Finisher Medal. I am happy with my times and placing. Very Tired and taking some time off to rest and relax and think on what is next for me. Have some fatigue carry over from the HR 8K last weekend. I have been feeling / suffering from post race fatigue and let down. Took a couple of days off from my running, Late afternoon, got myself outside and did a 6.1K run. I did the run and measured it on Map My Run. Did not time it or anything like that. feeling a little better , getting out and doing the run has lifted me up at least i think it has. time to feed Tuffie (my cat) and cook supper. having baked fish . I am feeling my oats. Thought i could "jog" out of me the body fatigue from the Harry Rosen Spring Run off.. I certainly got that wrong . The jogging did not make me feel better, . In fact , it has made me more tired. Yonge Street 10 K as a spectator. Reading , TV are this evenings plans. Ran in the Harry Rosen 8K on Saturday. Pleased with my run, as i trained very hard over the past three months. Time is 52:19 Finished . 589 th place on 1003 women entries. First in my age category F65-69 . Got a very nice Swag Medal . 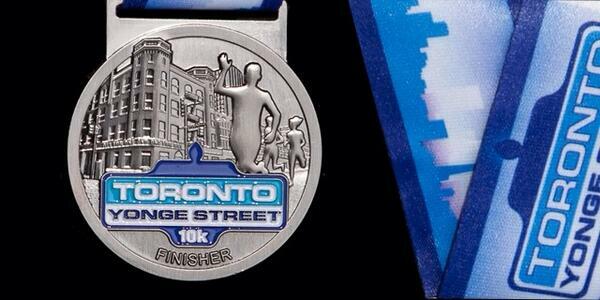 or Finishers Medal. . Arrived home and was relieved that my cat was fine. This morning went to Yoga at Lululemon. The class led by Bethany from Studio 330. the class was perfect for me - enabled me to decompress after yesterdays race. .
. Hoping I can manage it after this weekend. 10K is long for me. Lots of important stuff on this week's To Do List.. My tax return being at the top of my list..
this day is known as April fools day. think this is crazyness and not worth thinking or bothering about. think we would be better off without it. Did a decent run in the late afternoon. think its time to do things differently.